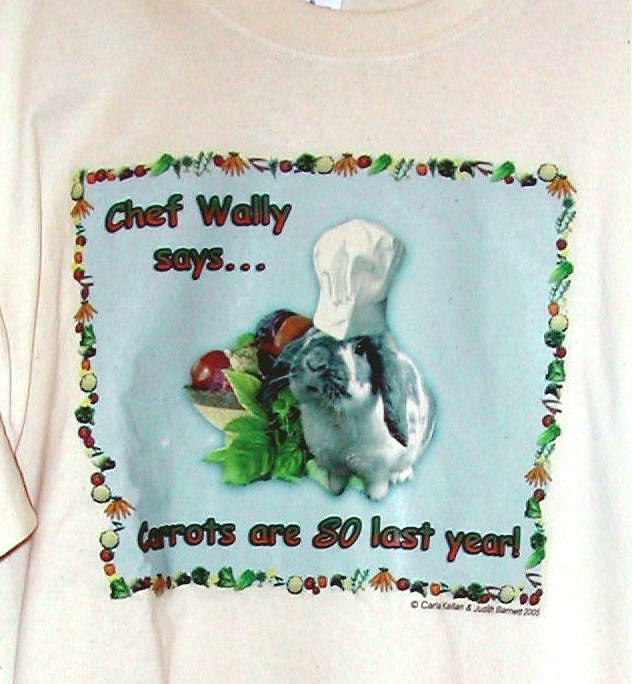 "Buy a shirt, help a bunny"
100% PERFECT Shirts marked down! Save Money, Help a Bunny. Click Order Form when you've made up your mind. Or just email me! 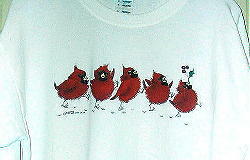 Christmas Cardinals on white longsleeve shirt. 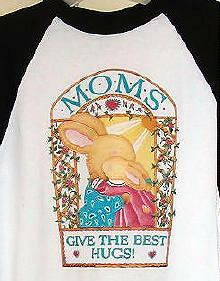 Size L.
Moms Give the Best Hugs on white and blue baseball shirt. 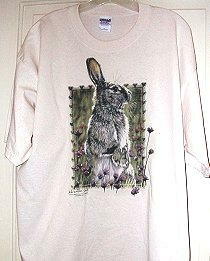 Women's size M.
Hello Bunny! 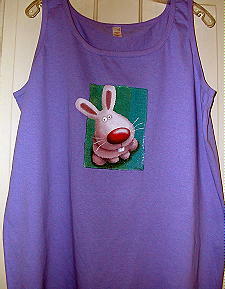 Lavendar tank top. Size XL. 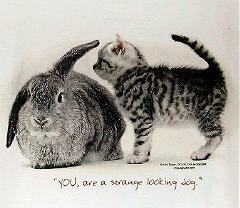 Lookout Bunny on natural. XL. Printed an iota light. $15.99. SOLD. 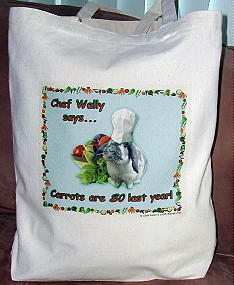 RIFRAF petite white tote with 12" handles. 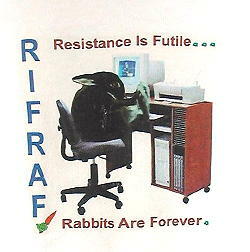 13 x 13 x 2 1.5"
"Resistence is Futile: Rabbits are Forever!" $5.50. 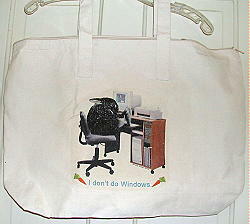 Buyer's Goof Day! 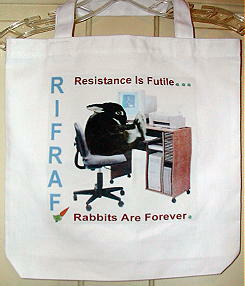 Select Irregulars marked down for Quick Clearance! Meadowbuns. Ladies Marsh Landing scoop neck. 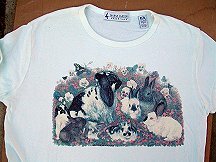 Women's Large. Goof: Image not perfectly centered. $5.99. 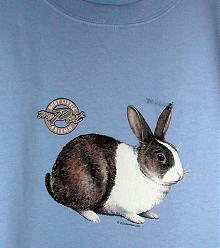 Rabbit! 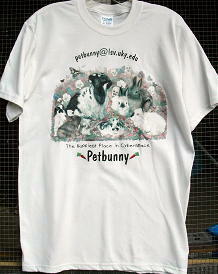 on light blue shirt. 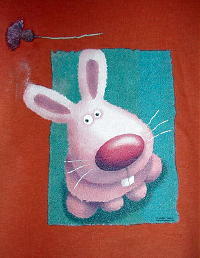 Size L.
Goof: Ear is smudged, rabbit not quite level. $2.99. 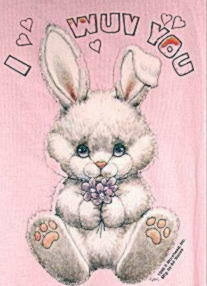 I Wuv You on pink shirt. XL. 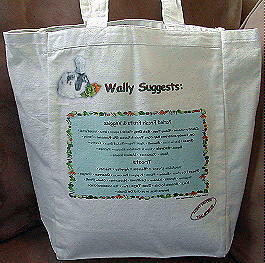 Goof: Print imperfect (but horizontal wrinkle lines are NOT there; photo not great.) Still cute! $7.99. 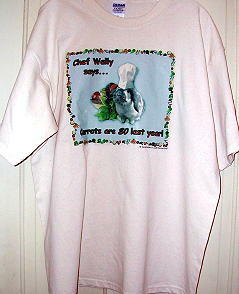 Chef Wally on natural shirt. XL. 2-sided shirt. 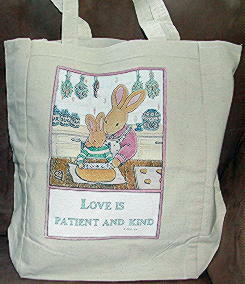 Hello Bunny on burnt orange. Small youth. Goof: smudge near outside ear; tiny gap between flower and stem. $7.50. Strange Dog on white. XL. Goof: small design smudge on lower lop ear. Truly barely noticeable. $14.99. Goof: small cracks in Oscar. $4.00. 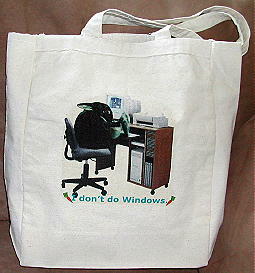 Oscar "Don't Do Windows" Large zipper tote. Long handles. Goof: A bit of Oscar did not smoothly adhere to the canvas. $11.50. 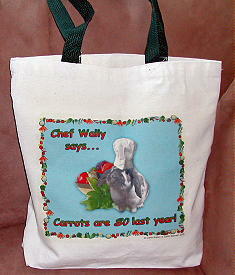 Chef Wally standard tote (14x10 1/2x5 inches). Long handles. Front side only. Goof: Printed too brightly. $9.50. 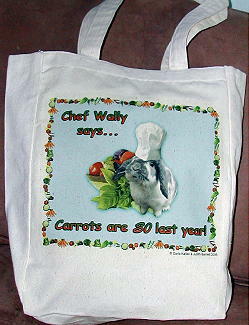 Chef Wally standard tote. Front & Back. Goof: LOL!! 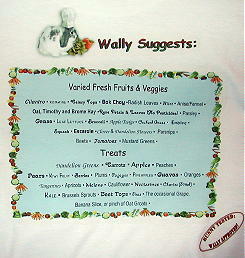 Veggie list in blue square reverse printed! $10.00. 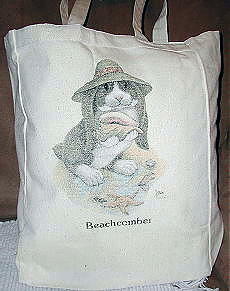 Beachcomber Bun standard size tote. Goof: Printed too lightly. $ 8.49.